I'm embarrassed to say that I recently finished a quilt for my sister in law. 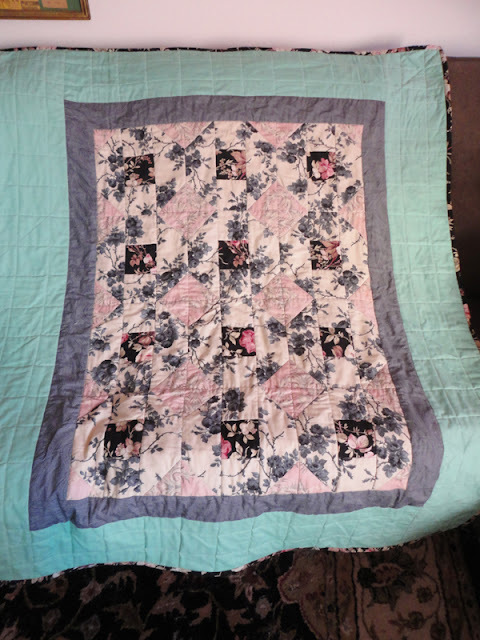 The reason I am embarrassed by this is because I started the quilt in January 2012. I don't ever have any UFOs in my sewing room, with the exception of quilts. 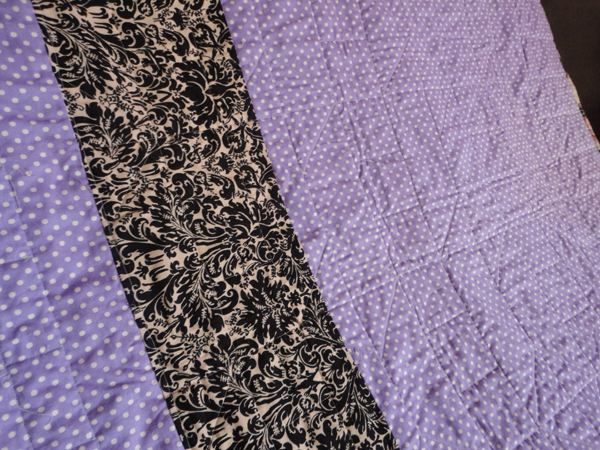 Last year garment sewing took priority and my two quilt projects were quickly forgotten. This past weekend I organized a surprise 30th birthday party for my husband and my in laws came all the way from London. I rushed to get the quilt done in time for my sister in law, Ariana, and I was so happy to be able to give it to her in person. One of the best feelings is making someone a gift and having them be so grateful and thankful for all the work you put into it. Ariana was so happy and excited with the quilt! She asked me all about how I made it and fell asleep with it soon after. 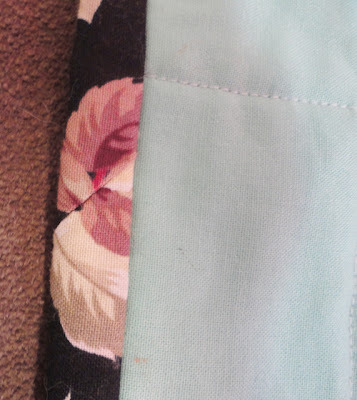 I wish I could remember more about the construction, but I sewed the majority of it so long ago. It's been sitting for probably nine months, just waiting to be quilted. Using a free motion foot is somewhat intimidating to me and I don't feel very confident with it, which is what held up the project. Stitching in the ditch seemed like the safe choice for this lap quilt, but in my next quilt I may challenge myself to try something different. Plus, my new machine (yes, I got a new machine at the end of December!) has the room to sew larger projects. I think I may have mastered the technique of attaching the raw edges of the binding pieces!! Before I start another quilt I am forcing myself to finish the other one I started last January.... so you might not see it for a while. It's a big one! Have any of you been bitten by the quilting bug? Very cute quilt:) I recently won a quilt pattern in a giveaway.. but am reluctant to start becuase I don't really know what I need? Honestly, you probably already have all the supplies you need. I use my rotary cutter and large plastic ruler a LOT when I'm quilting. A quarter inch foot for you machine is helpful, a free motion foot if you want to do some free style quilting, and a walking foot. Many machines come with these feet though! I quilt just as much or more than garment sewing! I prefer reading people who blog about garments, but don't get all the quilting-hate among them! I love being frugal and using up every last piece, learning new techniques that I can use for both clothes and quilting, and having "heirloom projects" that's be around forever, as opposed to a piece of clothing that gets worn out. Plus, I love looking at all the little scraps in my that remind me of others projects, dresses I had as a little girl, etc. 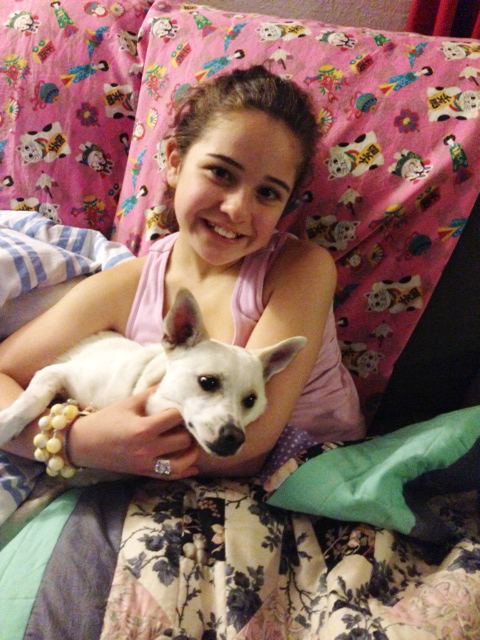 Beautiful quilt, lucky girl. Happy Bday to the Mister. Wowzers, this is beautifully made! Funnily enough, I've been looking into quilting recently - I have a couple of close pregnant friends and I'd love to make them a baby quilt each! I think I'll start simple though and see where it takes me...yikes!!! One of my favorite parts of sewing is shopping for fabric. 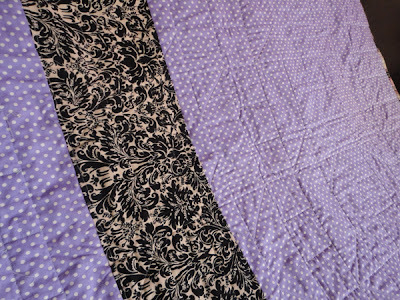 When you are making a quilt it is twice as fun because you can use wild color combos! I'm currently working on my first quilt for my daughter's 25 bday. I was crazy for starting it 3 weeks before the deadline, making it almost twin size and machine quilting it myself. I have less than a week and plan to finish it on time. I will make another but will definitely plan better next time. You can do it! Let me know how it turns out. it's so pretty!! and that dinner still brings tears to my eyes, so special! The actual quilting part isn't as fun to me... But I do love making the quilt tops! I could picture you making a beautiful quilt from 30s reproduction fabrics!!! That is very pretty. As someone who quilted first and then made clothing, I have to say that I think quilting is amazingly easy in comparison. It's very forgiving, for one, especially scrap quilts. You can put basically anything together and it'll look great. Just get a basic quilting book from the library and go. It's very relaxing and a beautiful way to live in your home. The quilt is beautiful! I haven't been bitten by the quilting bug yet, but the thought of attempting one is lingering in the back of my mind. I've definitely been quilt planning and pinning inspiration... so maybe soon. I'd totally be interested in learning more about the process of quilting, if you're willing to share. I am far from an expert, but maybe I will post a couple of tips for people starting out. 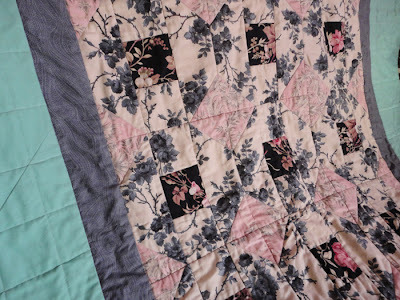 It seems like some other garment sewing bloggers are getting interested in quilting and I like it! 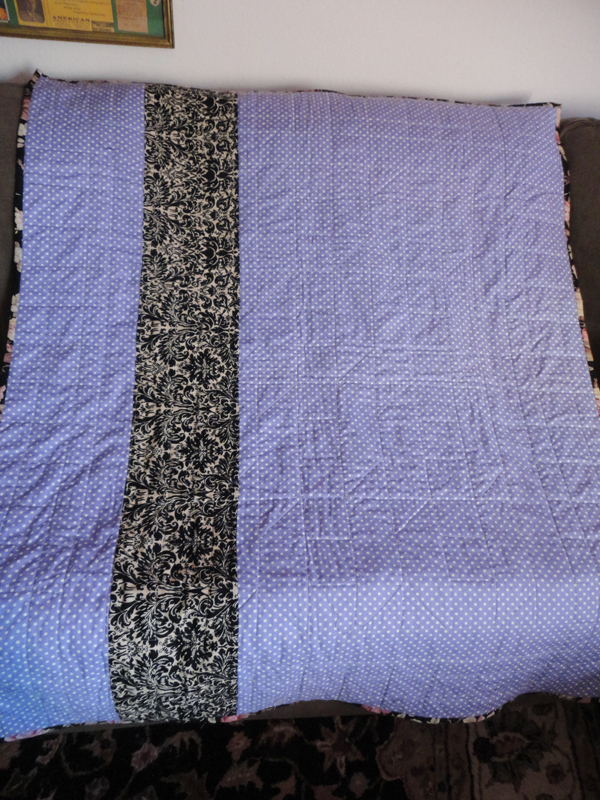 My sister and I made a quilt back in November for a baby shower for my neighbour/sister's friend. I had no idea what I was doing. We made a striped, ombre, nautical lap quilt, bigger than a baby quilt, but maybe just big enough to cover a single bed? We did it in a week. A WEEK. It was one of the craziest things I've done. It wasn't patchwork or anything though. We just cut stripes of different heights all with the same width, sewed them together and then we just quilted in straight lines. Even if I was brave enough to quilt in crazy patterns (which I'm not), we didn't have time. Basically all of my free time was spent cutting and sewing and my back was sore as heck afterwards. But it turned out great! I'll be posting about it soon. Other than that, I am working on a quilt for a stag and doe (google tetris quilt! ), but honestly, I prefer garment making. Much faster and more enjoyable. Less thing that you have to think and worry about! A WEEK?!?!?!! You are wild!!! That is so much work! Someday I would love to do a strip quilt that way. Hi! I just found you through the "Map the Sewintists" map so I could figure out who was in my approximate neighborhood. And I totally remember you from the Sew L.A. event for Gertie's book! We didn't speak, but I totally recognize the cute clothing! Nice to see a local because it seems as though I tend to follow a lot of bloggers from the Pacific Northwest or New York of course. Subscribing now! Hi Diane! Nice to officially meet you. That party was great, wasn't it? Do you live in LA? the quilting bug is biting, I just haven't the time right now... but I keep thinking about starting with an easy baby blanket. oh I so want to!! But I need to work on a few garments first, and especially my 40's dress!! Oh I wish I could say I have no UFO projects in my sewing room :-( Your quilt is beautiful. She will treasure it forever. Thank you! The only reason I don't have any UFOs is because I don't have the room for it! I haven't gotten the quilting bug yet but I would love to try. This one that you made is so lovely! What a lovely gift! Better late than never, I say!